Tax season in 2017 coincides with the next item on President Trump and congressional Republicans’ legislative agenda—tax reform. As we’ve argued previously, we’re unlikely to see anything resembling 1986-style “tax reform,” which—whatever its flaw—really was a bipartisan effort to find efficiencies that could be introduced into the tax code, and which was revenue-neutral. Instead we’ll likely end up with deficit-financed tax cuts for the rich. And in that vein, the Republican opening bid sure is a doozy. According to the Tax Policy Center (TPC), in the first year of Speaker Paul Ryan’s “Better Way” tax plan, released in 2016, fully 76 percent of the benefits would go to the top 1 percent. A narrow slice of that group, the top 0.1 percent, would get about 47 percent of the plan’s total benefits, more than double the bottom 99 percent of households combined. The tax plan even manages to get considerably more regressive over time—by 2025 the top 1 percent would get 99.6 percent of the benefits. In practice, this means that in 2017 households making more than about $700,000 would get an average tax cut of around $200,000. And households making more than $3.7 million would get an average tax cut of $1.2 million. The rest of us don’t fare as well as the rich. Households making less than $25,000 would get only $50 on average. In fact, of the income groupings analyzed by TPC, none of groups within the bottom 95 percent (which covers everyone making less than about $292,000) would see an average tax cut larger than $410. Note: The scale required to accommodate the average tax cut for the top 0.1 percent is so large that it renders the tax cuts for the bottom 99 percent essentially invisible. Imagine Republicans didn’t have a singular focus on giving the rich more money and instead just wanted to implement large tax cuts. 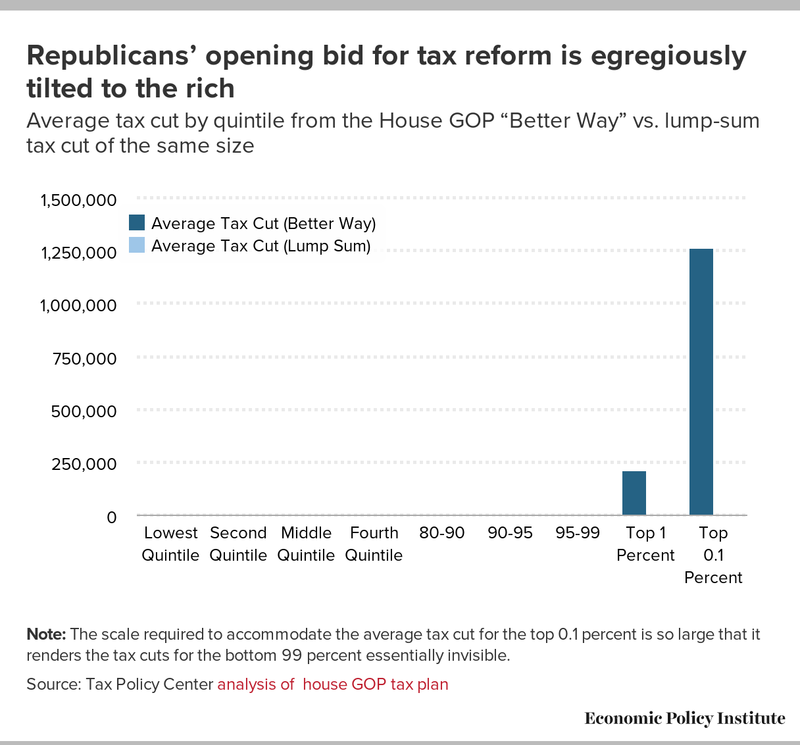 Compare the Republicans’ opening bid to a simple lump-sum tax cut of the same size. A $3.1 trillion tax cut could simply give every household $1,810. This would be a huge improvement for the bottom 95 percent of households. Is a lump-sum tax cut a great policy? Of course not. We’ll need more revenue in the longer-run, not less. And if the federal government has $3.1 trillion to give away over 10 years, it should be better-targeted than a lump-sum tax cut. But even this incredibly simple-minded policy would be hugely preferable to what Republicans have offered up as “tax reform.” Of course, Republicans will claim that lump-sum taxes won’t spur the behavioral changes that make their preferred tax cuts so effective in spurring economic growth. But the supposed growth-enhancing magic of cutting tax cuts for rich people has been tried and failed. 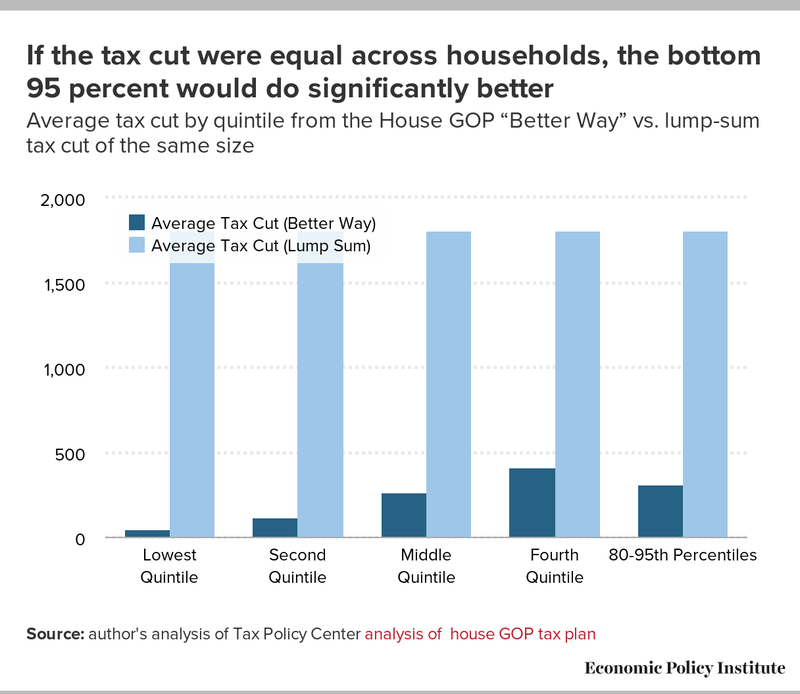 If Republicans wanted tax reform to help the vast majority of American households, they could easily aim their plan’s benefits at the vast majority of American households. Instead, the details of their plan reveal that they don’t intend to anything but give tax cuts for the rich.